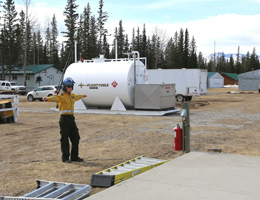 The Camp Boss is employed in the Area and is responsible for the operations and maintenance at one or multiple Primary or Secondary Fire Bases within the Area. This position will coordinate catering and janitorial contracts for the camp, ensure the camp is kept clean and orderly, and complete on site maintenance as required. This position requires excellent communication and organizational skills, ability to multi-task, commitment to work long hours when required, and work well in team environments as well as independently. Physically able to perform the manual duties found in the position assignment. Previous experience in Forest Protection or Camp Management is an asset. Brief and assign rooms to personnel as they arrive in camp. Order and receive equipment & Supplies required for camp operations. Ensure camp is kept in a clean, orderly, and sanitary condition. Complete onsite maintenance as required. Oversee catering & janitorial contracts for the camp. Maintain counts and order aviation fuel as required. Interact with local fire centre in particular the local logistics room. Complete required paperwork daily for camp operations. Perform all work in a safe manner, reporting all accidents, incidents, and near misses. Be familiar with applicable policies and standard operating procedures. Be available for possible export to other areas. The typical work week is a 40.00 hour week (8.00 hours/day). You will be required to work overtime as required based on the fire danger. Schedules between Areas will vary however you can expect to work either a 5/2 or 10/4 shift. Am I able to live at the camp? Accommodations are provided at the facility at no cost.